Faithful functor: Let be a functor between two categories. If the map Mor Mor is injective, then the functor is called faithful. For example, the functor between the category of sets with only bijective mappings qualified to be morphisms between objects, to the category of sets with all kinds of mappings allowed to be morphisms, carrying objects and morphisms to themselves, is faithful. Full functor: If Mor Mor is surjective, then the functor is called full. For example, the functor defined above is not full. 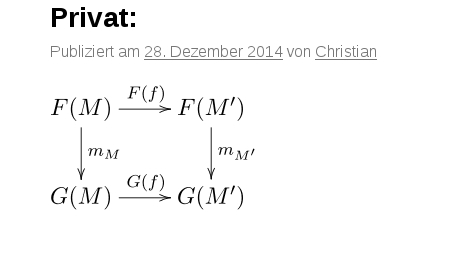 Philosophical point: Why are commutative diagrams so omnipresent and important in Mathematics? It seems to be a fairly arbitrary condition to satisfy! Commuting diagrams essentially signify that “similar things” are happening at “different places”, and the “similar things” can easily be inter-converted. Too hand-wavy? Please bear with me. Say are all , and is idenity. Also assume that maps . Then if also maps , then is a natural transformation. However, if is of any other description, then is not a natural transformation. Forming other examples should convince you of the fact above.